Hamilton is a rural-suburban town in the eastern central portion of Essex County in eastern Massachusetts, United States. At the 2010 census, it had a population of 7,764.Currently the town has no manufacturing industry and no industrially-zoned land. Its location on the North Shore of Massachusetts provides easy access to the Atlantic seashore with its reservations, beaches and boating. The town includes many historic houses, pastoral landscapes, and old stone walls that accompany winding tree-lined roads. It also has a rich equestrian heritage, which remains strong due to the influence of the many horse farms and of Myopia Hunt Club, which holds frequent equestrian events, including polo most Sunday afternoons. (Myopia also hosts a Thanksgiving Day fox hunt each year that the public may attend.) Thus, the visitor to Hamilton may well share the secondary roads with horse and pony riders. Hamilton is closely tied to neighboring Wenham, sharing a school system, library, recreation department, commuter rail station and newspaper. In 2010, the community of Hamilton-Wenham was listed among the “Best Places to Live” by Boston Magazine. 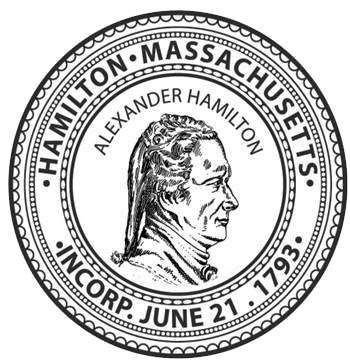 Hamilton includes South Hamilton, which is that part of Hamilton that the Postal Service has assigned the zip code 01982. “Hamilton” and “South Hamilton” are indistinguishable from each other except for the difference in zip codes. Hamilton was first settled in 1638 and was originally a section of Ipswich known as “The Hamlet”. The first recorded land grant in the Hamlet was Matthew Whipple’s farm, dated 1638. Three years later the new stagecoach road from Boston to Newburyport (Bay Road) was laid out through the Whipple land. Other early settlers of the Hamlet, including the Appletons, Winthrops, Lamsons, and Dodges, were attracted by countryside similar to the English farms and estates they had left behind. The farm village proved to be an attractive location for Boston groups seeking land for recreation and renewal. A Methodist ministers’ association first held a camp meeting at Asbury Grove in 1859. In the 1880s, the Myopia Hunt Club, which had been named in jest for its nearsighted founders, moved from Winchester, Massachusetts, to the Gibney Farm in Hamilton. Beginning as a lawn tennis and baseball club, it turned to polo, the hunt, and golf as members built large summer estates in the area. Myopia donated the site for the General George S. Patton Memorial Park to the town of Hamilton. The park continues to be a recreation center for the town.